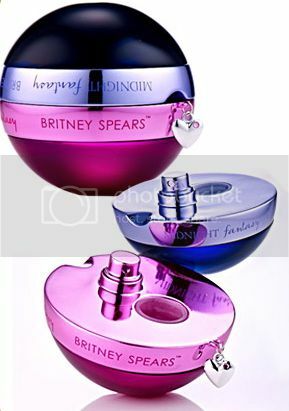 Britney Spears has released a new fragrance line that offers two of her best selling perfumes in just one bottle. The Fantasy Twist consist of Midnight Fantasy and Fantasy perfume in which users can choose whatever scents fits their mood for the day or simply choose both depending on the mood creating another scents. The cute spherical bottle has the Fantasy scent in the pink section in bottom and if you twist that off, you get to Midnight Fantasy in a blue section on the top. The difference between the two scents. Midnight Fantasy offers an exotic mixture of woody musk and white patchouli, while Fantasy is a fruitier option with hints of jasmine and red lychee. Britney Spears unveiled its first look on her Twitter page showing a mirrored image of the pop star in pretty blonde and exotic dark looks saying: "1st look at my #FantasyTwist ad. Watch @extratv tonight for behind the scenes from the shoot with Ellen Von Unworth!"